It is essential to optimize the quality of data from any downhole or near surface seismic application. To do this efficiently, the use of multi-element assemblies on each axis of the geophone is recommended. Experience with more than 3,000 of these proprietary packages, as well as the supporting theory, reinforce the contention that this is currently the most cost-effective way of acquiring high-quality system data from both near surface and downhole installations. The geophones should be used with Terrascience’s proprietary double shielded, grease blocked cable to minimize crosstalk and optimize signal quality. Naturally, these cables and geophone assemblies are designed to provide >15 year performance. 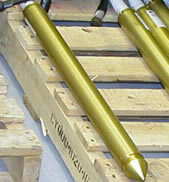 TSL can supply both surface and borehole geophone packages custom suited to any client's needs. TSL geophone packages are manufactured either from 6061 T6 aluminium or 316 ELC stainless steel.